Home > Lighting > Candle Holders > COMING SOON! 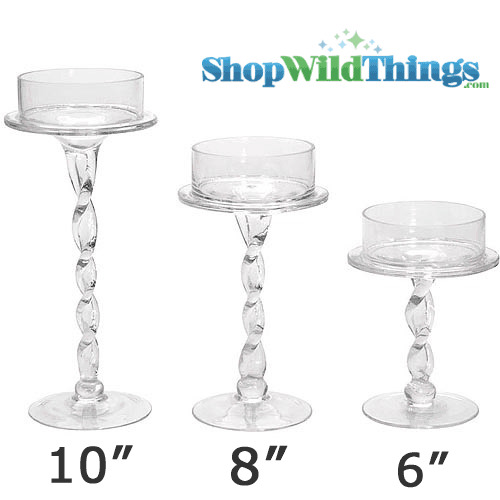 Candle Holder, Glass, Twisted Stand, 6"
COMING SOON! Candle Holder, Glass, Twisted Stand, 6"
Our new glass candle holder is so unique and is sure to add a touch of class and style to your event decorations! The twisted stem makes this candle holder stand out like no other. 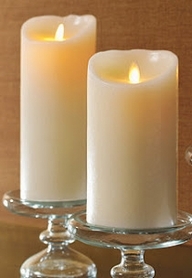 The candle holder is 6" tall with a base diameter of 3.5" and it will hold up to a 3" diameter pillar candle. Add another dimension by embellishing the lip surrounding the candle cup with trimming or bling. Due to the nature of this genuine glass holder, slight imperfections may occur. This came really sturdy and elegant!!! perfect for my wedding diy decorations in the mantles... i bought 3 sets of 6', 8', 10' and will order additional set as it turns out beautiful after I placed my kissing balls on top! Delivered safely and securely too! One item has a little bit of crack but the replacement was automatic! Super happy ! I purchased these candle holders for my daughters wedding. They are a perfect size for centerpieces. The items are great. I'm using them as part of wedding decorations. Really pretty and useful as centerpiece containers! We used these to hold 8" pomander floral balls as centerpieces. Perfect! There is also enough of a well to hold a small block of oasis foam for regular centerpieces. Think outside the pillar! Merchant Response:What a great idea!! Thank you for sharing. We love our creative, talented customers! ProsNice, heavier weight glass. Pretty twisted stem.